Home > CVM News > Veterinary Students Fulfilling Preceptorships Across the U.S.
Veterinary Students Fulfilling Preceptorships Across the U.S.
Spring break was work time for the Auburn University College of Veterinary Medicine Class of 2018, which started its journey of gaining real-world experience in their chosen disciplines under the supervision of veterinarians around the U.S. The students’ eight-week preceptorships allow them to apply what they have learned in classrooms, laboratories and clinical rotations for the eight weeks prior to graduation. 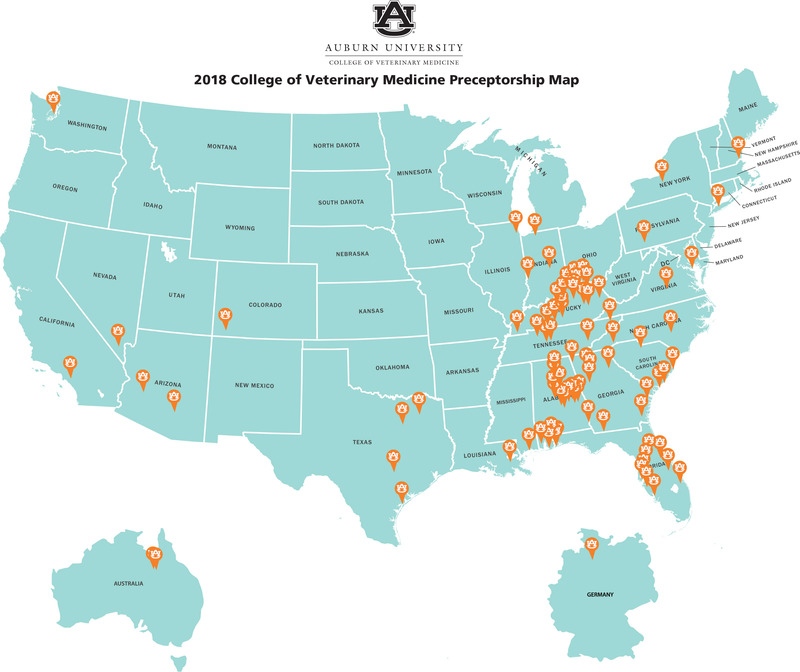 The 123-member class chose a variety of specializations and locations for their preceptorship: 22 students are gaining professional experience in Alabama and 30 in Kentucky, and the remainder are completing preceptorships in various states and some at more distant locations—including two students serving at veterinary clinics in Queensland, Australia, and one at the University of Veterinary Medicine Hanover in Germany. 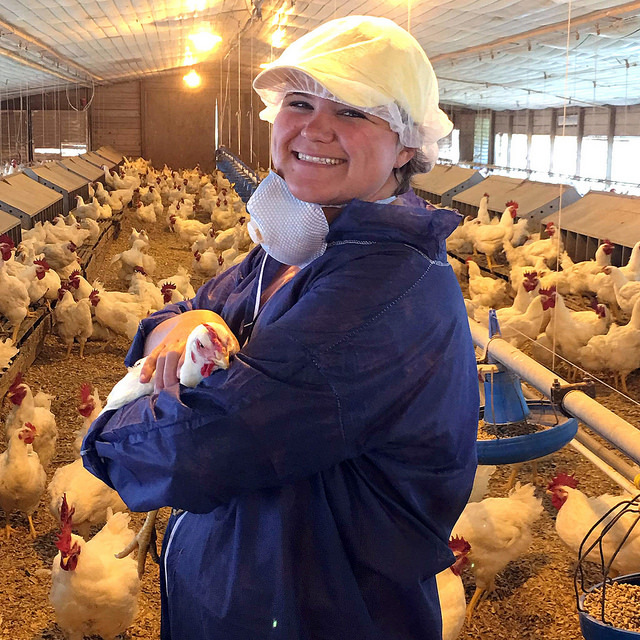 For instance, Maggie Thompson, from Andalusia, Alabama, is at Koch Foods in Chattanooga, Tennessee, where she is working with poultry flocks. Koch Foods is the fifth largest broiler producing company in the United States, processing approximately 50 million pounds of chicken meat annually. Thompson earned her undergraduate degree from Auburn in poultry science. With a career goal of specializing in avian medicine—specifically, commercial poultry—Thompson says her preceptorship will provide the opportunity she desires to gain valuable practical experience. 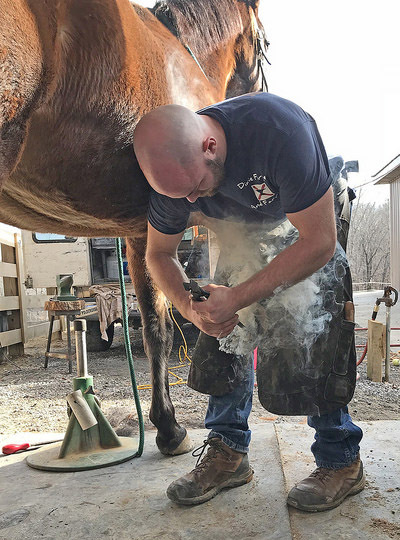 Zachary Hulbert, who also is a farrier, is spending his preceptorship at Rood and Riddle Podiatry Center equine practice in Lexington, Kentucky. “I got interested in the farrier skill after learning about it while working with a farrier in summer 2015,” Hulbert said. “My main reason was to learn how to pull shoes for radiographs and to learn proper hoof conformation to better communicate with the farriers I would be working with in the future. Hulbert says his primary goal from this preceptorship is to further his knowledge about equine podiatry. “I chose Rood and Riddle because they have some of the best minds in that field to learn from,” Hulbert said. Ashley Harrison chose to stay close to Auburn, fulfilling her preceptorship in the mixed-animal practice at Castaway Animal Clinic in Eclectic, Alabama, near Lake Martin. Harrison is working in a small animal practice following graduation, but her long-term goal is to have her own mixed-animal practice and to work with equine and other farm animals as well. She hopes to gain a broader knowledge about various disease processes and treatment options during her preceptorship. Students are required to choose a host practice that is at least 30 miles away from the Auburn campus. Practices undergo a rigorous evaluation process before they are approved to host a preceptor student. Applications are reviewed by a committee to ensure that they meet the high standards of practice that the college requires. Once accepted, practices can continue to host students for four years before repeating the application process. The Class of 2018 completes preceptorships in early May, when they will return to the Auburn campus for preceptorship debriefing. The class will participate in commencement ceremonies on Tuesday, May 8, in Auburn Arena.